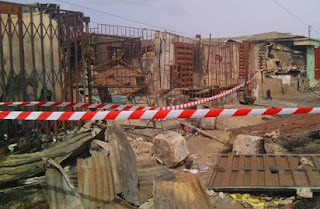 The three siblings, Christiana, Feranmi and Pelumi, who were burnt to death in the fire that engulfed some shops at Mechanic village, Oke-Afa, Isolo area of Lagos State, would have escaped death last Thursday, had their mother granted their wish. The children, as gathered, begged their mother to take them with her, when she was leaving at about 10p.m., promising the children that she would be back by 11.30p.m. According to a woman, who claimed to have been with the children’s mother at the time, Pelumi, 6, passionately begged his mother not to lock them inside. Their mother was said to have bought them biscuits and bobo drink, and then left. to death. The children’s mangled bodies were reportedly discovered close to the door with the eldest’s hand on the door handle apparently trying to open the door. Since the incident occurred, most of the shops around have remained under lock and key except a beer parlour, close to the burnt shops. Investigation by Vanguard revealed that the woman, who is now on the run, was first married to a man, but divorced him after having four children for him. The estranged husband was said to have taken two of the children, leaving Christiana and Feranmi in their mother’s custody. Thereafter, she reportedly got hooked to her present husband who resides in Ejigbo area, whom she had two children for. Her husband was said to have given her two shops. She used one for sales of provisions and salon operation, while the other served as bedroom. Report had it that she usually locked the children in the shop any time she went out. Meanwhile, Lagos State Police Command seems to be silent on the fire incident alleged to have been triggered by a head-on collision between a LT 27 bus being chased by a team of policemen, and a 14-seater stationary commercial bus. Report had it that a team of policemen, suspected to be from Ejigbo Division, chased the LT 27 bus loaded with jerry cans filled with petroleum product.